Last spring, the cinephile community and film industry lost the legendary film critic Roger Ebert. But thankfully, he leaves behind a legacy of profound film criticism and inspiration for generations of aspiring filmmakers, writers and more. While a film called Russ & Roger Go Beyond will follow the friendship between filmmaker Russ Meyer and Ebert while working on the film Beyond the Valley of the Dolls for Fox in the late 1960s, the newly premiered documentary Life Itself talks about that time in Ebert's career, but more importantly, focuses on the man himself, his passion for film, and love of life and those closest to him. Life Itself is directed by Steve James (Hoop Dreams, The Interrupters), who dives into the life of Roger Ebert, his rise to prominence in journalism (including a Pulitzer Prize) and those who knew him best. 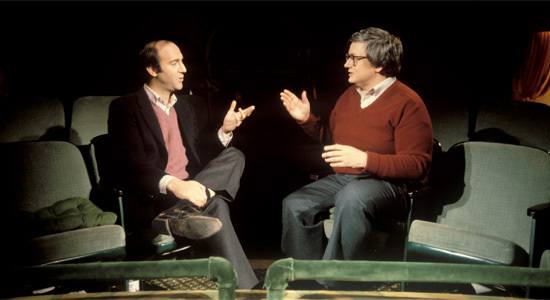 From the beginnings of his lucrative and well-known collaboration and love/hate relationship with fellow critic Gene Siskel from the Chicago Tribute (which is only regarded as being "across the street" from The Chicago Sun-Times) to Ebert's affect on young, rising filmmakers, Life Itself paints a fond portrait, but doesn't gloss over Ebert's well-known arrogance, drinking problem, and other shortcomings. What would have been an engaging and interesting documentary chronicling the life of arguably the most iconic film critic in history is heightened by Ebert's tragic battle against cancer and his recovery following surgery that left him without a jaw, and took away his ability to speak. Moments following Ebert in the hospital, never looking morose or feeling sorry for himself are simultaneously warm and crush the heart. It's just difficult to see Ebert in this condition despite his upbeat demeanor and constant energy, especially when contrasted with footage from his various appearances on TV, at conferences and film festivals. Ebert's voice is made prominent by way of his talking computer, spouting off whatever he types. Right up to the end, his defiance of his debilitation and refusal to let it quiet his voice by taking to blogging is pure Ebert, and for a moment, you forget that Ebert has left us. But the real insight and honor comes from all the talking heads. Whether it's colleagues from The Chicago Sun-Times, his wife Chaz Ebert (who really completed the critic as a man) and their family, directors like Martin Scorsese and Werner Herzog, critics like A.O. Scott, or people who have known him since college, they all have touching and funny things to say. Life Itself doesn't try to be a tribute to Roger Ebert, but naturally becomes one because of the impact Ebert has had on the film industry. That doesn't mean there isn't room for a little bit of jabbing, especially when it comes to his primal motivation for making Beyond the Valley of the Dolls with Russ Meyer, or the use of hilarious outtakes from "At the Movies" promos where Siskel and Ebert are at each others' throat. The film is pretty much a warts-and-all look at Ebert's life and career, and Ebert wouldn't have wanted us to overlook these details of the movie that was his life. After all, he was a critic. On a personal note, this writer couldn't have been in a better screening for Life Itself, as the room was full of film critics and industry professionals, with several audible sniffles and the wiping of tears scattered throughout. There's something special about watching a film about the man who inspired you to end up in a movie theater doing what you love, and hearing about Ebert's final days was a very moving and teary-eyed experience. Life Itself is endearing, inspiring and honest, with Ebert himself making sure James leaves no stone unturned and doesn't hide Ebert even during his difficult hospital visits. The film deserves a thumbs up, but Ebert took that with him to that great movie theater in the sky. Thank you Ethan for a touching, well written review... looking forward to seeing this.